Synopsis: Twelve-year-old Amal’s dream of becoming a teacher one day is dashed in an instant when she accidentally insults a member of her Pakistani village’s ruling family. As punishment for her behavior, she is forced to leave her heartbroken family behind and go work at their grand estate, surrounded by a high brick wall and gate guards. Amal is distraught but has faced setbacks before. So she summons her courage and begins navigating the complex rules of life as a servant, with all its attendant jealousies and pecking-order woes. Most troubling is Amal’s increasing awareness of the deadly measures the Khan family will go to in order to stay in control. It’s clear that their hold over her village will never loosen as long as everyone is too afraid to challenge them — so if Amal is to have any chance of ensuring her loved ones’ safety and winning back her freedom, she must find a way to work with the other servants to make it happen. Fans of Aisha Saeed’s Written in the Stars, will eagerly devour Amal Unbound, a heartbreaking and hopeful story about believing in yourself and finding courage in the midst of danger. Saeed’s bold and skillfully penned novel creates an exceptional reading experience that will touch your soul. The setting is culturally rich as it is about Pakistani traditions, village schools, small villages, shopping in local markets, food preparations, the landscape, neighbors knowing everyone’s business, and the pressure on mothers to birth baby boys. The first-person narrative with Amal offers greater depth into her character. Amal is a strong, determined and clever protagonist who loves school and dreams of going to the university and becoming a teacher one day. When her mother suffers postpartum depression after the birth of a fifth daughter, her father makes Amal quit school to care for her siblings. Not one to give up, she manages to find a creative way to keep up with her school work. When Amal stands up to the wealthy Kahn son, Jawad Sahib, at the market and refuses to give him her purchases, her world begins to crumble. As a punishment, he makes her a servant at the Khan family home. The characters are well-developed, memorable and despicable. They will stay with you after you finish. The plot is suspenseful and dangerous at times. The author shows much of the action, which is more powerful than words. Even though Amal is living in luxury serving the kind mother of the brutal landlord, it will always be a prison for Amal. But Amal is smart and resourceful and she uses it to her advantage. Amal Unbound is a page-turner and I could not put it down. The author manages to surprise me with the unexpected ending. Readers will be cheering. It is so hard to imagine that indentured servitude is a problem that still exists for millions of people globally. It takes many forms and occurs in the United States. It is a corrupt and dangerous business. It is Saeed’s hope that Amal’s story will shine a light on the brave girls enduring servitude. 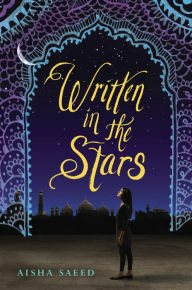 Aisha Saeed is the author of Written in the Stars. As a Pakistani American and one of the founding members of the much-talked-about We Need Diverse Books Campaign, she is helping to change the conversation about diverse books. Visit her at her website. Synopsis: Naila is a responsible and trustworthy daughter to her immigrant Pakistani parents. Steeped in cultural tradition, her parents allow her to attend a Florida high school, study subjects she likes, wear her hair how she wishes, dress like the other students and choose her career path in college. The only thing she is not allowed to do is date boys or choose a husband. Naila falls in love with Sajf, a Pakistani-American boy, during her senior year. She keeps her secret and meets Saif for lunch everyday. When Naila disobeys her parents and sneaks to the senior prom with Saif, her parents are outraged at her betrayal of trust and humiliated by their close-knit community. In attempt to help Naila understand her heritage, they pull her out of school, travel to Pakistan to visit relatives. Naila enjoys meeting so many family members and bonding with her cousin, Selma. Her vacation turns into a nightmare when her parents betray her, force her into an arranged marriage with Amin, and then leave Pakistan. She is alone living with a strange family, who see her as their ticket to America. Is this Naila’s destiny or is there any hope for escape? Aisha Saeed has masterfully written a bold, heart wrenching and complex cross-cultural novel that will be an eye-opener for many young readers. It is also beautiful love story between two Pakistani-American teens. The setting is culturally rich for teens reading Written in the Stars. It is about Pakistani traditions, extended families living together, food preparations, small villages, the landscape, neighbors knowing everyone’s business, and shopping in local markets. The first-person narrative with Naila offers greater depth into her character. Naila is a strong and determined protagonist. Her anger and pain are palpable, as is her desire to escape. All of the characters are well-developed, memorable and stay with you after you finish. The plot is suspenseful and brutal at times. The author shows much of the action, which is more powerful than words. The reader experiences Naila’s prison. Written in the Stars is a page-turner and I could not put it down. The ending is unexpected. Resources: There is a lovely Author’s Note at the end, along with resources for individuals needing advice, and a glossary. Visit Aisha Saeed at her website. Aisha Saeed is a Pakistani American writer, teacher and attorney. Written in the Stars is her debut novel. She is on of the founding members of the We Need Diverse Books Campaign. Opening/Synopsis: “Master says I have only two more months until my peshgi (family debt) is paid back. With that thought, Nadeem quickened his knotting of the scarlet weft threads on the loom and then beat them tightly into place with his panja. I’m sure Master means it this time, Nadeem hoped.” Nadeem dreams of being free, playing soccer with his little brother and going to school. He works in a dimly lit carpet factory from “dawn to dusk” breathing the dust of the wool that makes many kids sick. One day Nadeem meets Iqbal Masih, a boy who marches past the rug factories shouting “We are free.” Iqbal hands Nadeem some Freedom Letters abolishing child labor and urges Nadeem to pass them to the other children. Before the master intervenes, Iqbal hands Nadeem a pen and tells him he can go to school now. The next day Nadeem hands the Freedom Letters to all the children at the factory and bravely confronts the master. He makes a very risky and courageous decision that changes his life forever. Why I like this book: Pegi Deitz Shea writes a very important story about the power of children working together to end child labor in Pakistan. Her fictional story honors the legacy of a boy, Iqbal Masih, who risked his own life to free children from slavery so that they could attend school. Iqbal escaped from a factory and attended a rally held by the Bonded Labour Liberation Front (BLLF), an organization working to help bonded children. He began to sneak into hundreds of rug factories so he could educate the other kids about their rights. He became famous worldwide. Leane Morin’s illustrations are beautiful watercolors that show a lot of emotion and are unique. Each photo has a border with a special design –like a carpet border. Resources: There is a comprehensive section of backmatter full of resources for kids who wonder what they can do to about child labor around the world. There is the true story of Iqbal Masih, information about the United Nations and the work it does for the rights of all children, and UNICEF and its mission for children. There are many kid-friendly sites listed and a kid-to-kid global project that helps others. You can also check out Reach and Teach for more classroom activities for this story.